We all hear that we should drink more water, but plain water can be boring? Why not why fruit infused water? You can make this refreshing drink and hydrate your body in a tasty way. Sometimes at fancy Spas or some upper scale gyms they often serve a cucumber infused water. It is completely refreshing, and yes, it is delicious. You can make this at home. Yes, you can buy fruit-flavored waters, but they tend to have ingredients that we can’t pronounce. You can make this hydrating water at home. So toss out that juice box, and make some infused waters. Drinking fruit infused water has benefits. It is made with natural ingredients. You benefit from the natural oils and flavors of the fruit, but you do not get the calories of fruit juice. When you drink the ample amount of water each day you benefit your joints because they are fully lubricated, your organs and function fully when you are hydrated properly. Your skin looks soft, you will counter the dehydration from coffee and alcohol. By the recommended amount of water, you will feel full. 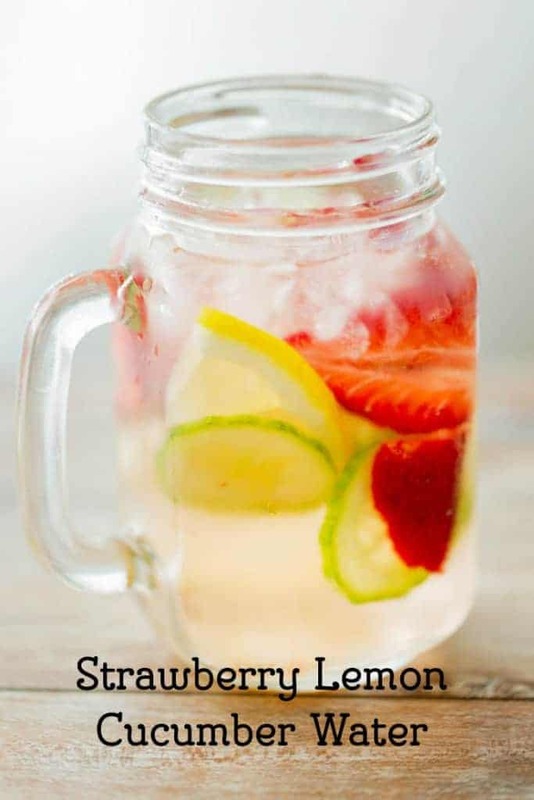 My Strawberry Lemon Cucumber water is made for a specific reason. Cucumbers will help rid your body of toxins, so it is there for detox. Lemons are added to help balance your pH, and strawberries are there to promote bone and heart health. Fruit infused water is so refreshing. Place sliced fruit in a pitcher and add water to fill the picture. Allow the fruit to infuse for at least 15 minutes before drinking. Optimal flavor is 2 hours. Store infused water in the refrigerator. If you aren't going to drink right away remove fruit, as it can make the water bitter if left in for too long. I keep a large container on ice at work for my colleagues (and me). So far we’ve had: orange/lemon/lime/grapefruit cucumber/honeydew/mint cucumber/mint strawberry/peach/mango/pineapple/mint pineapple/mint watermelon/basil strawberry/lemon strawberry/lime blueberry/blackberry/raspberry/lemon/lime Next, I think I’m going to try: strawberry/basil lemon/cucumber cucumber/lemon/mint/rosemary soon Some of the flavors are much better when made with frozen fruit (berries, peaches for sure). Anything that doesn’t exude much flavor seems to do better if it’s frozen first. And, it’s convenient to just buy some frozen fruit mixtures! We’ve got a lot more people drinking water! Are you trying to replace soda? Yum! This would help me drink more water during the day. I am really bad about that sometimes. This sounds really good. I do have a water infuser pitcher and am always looking for ways to mix it up with fruits and veggies. I don’t mind water at all but I know many people don’t. Sounds yummy.